Garlinase® 5000 / 30 tabs - Nature's Way®. Delivers 5,000 mcg of allicin, fresh garlic’s most beneficial compound. Is artificially aged in an accelerated process, destroying garlic’s most beneficial compound. Is Garlinase® 5000 enteric coated? Yes, Garlinase® 5000 is enteric coated. An enteric-coated product utilizes a protective outer layer to keep the beneficial garlic extract contained until it reaches the alkaline environment of the small intestine. There, the tablet dissolves, slowly releasing alliin and allinase to form allicin, which is absorbed into the bloodstream as it travels slowly through the small intestine. This ensures optimal absorption and reduces the odor often associated with garlic. Why do I only have to take one tablet of Garlinase® 5000 per day? There’s a lot of goodness in one small tablet. Garlinase® 5000 contains the equivalent of 45,000 mg of fresh garlic. 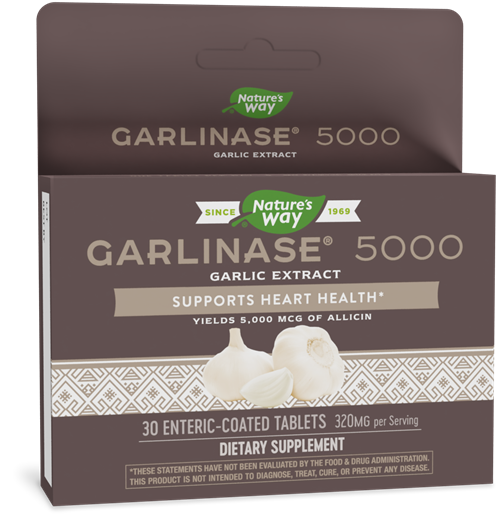 One tablet of Garlinase® 5000 provides the allicin potential of four cloves of fresh garlic. Do not use this product if you have a bleeding disorder, are taking blood-thinning medication, or are within a week of any surgical procedure. If pregnant, nursing, or taking any medications, consult a healthcare professional before use.